If Airasia is airline sponsor of Taylor Swift RED Tour, she is going to take Airasia plane to Malaysia ? Today is Tuesday June 10. But, There were no single news about Taylor Swift is arriving to KLIA 2. 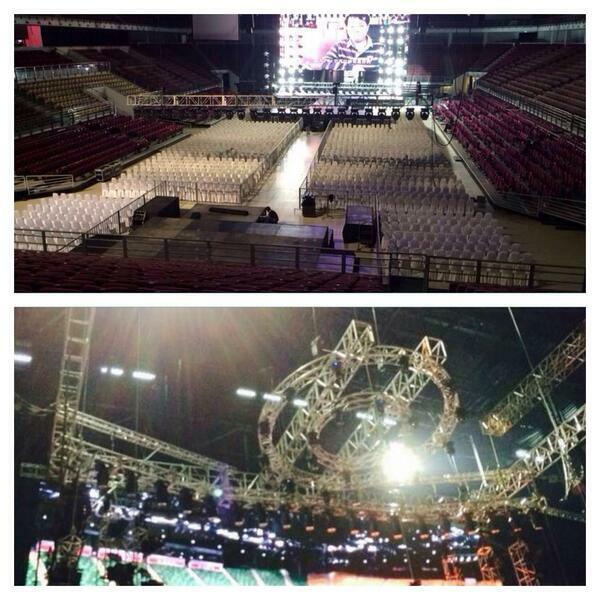 Her RED Tour in Malaysia would be tomorrow June 11, 2014. According to Taylor swift official website, she was having concert at Singapore indoor stadium on June 9. It could imply that she is coming to Malaysia with land transportation rather than air transport. We had enough those news saying Taylor Swift tickets have been sold out at both concert held in Malaysia and Singapore. There were no leaked news when Taylor Swift will be spotted enter Malaysia territory so that Malaysian fans can get to see her and ask for a Selfie or autograph. How about those fans get no chance to her because ticket were fully sold out. Taylor Swift is like a teen pop queen in US. She goes to any places will be filled by peoples who like to hear her album. Her name is no strange to us and we will give her warm welcome screaming out so loud her name. Due to her fame, there were reasons why her daily location cannot be publicize openly. From Hitz FM, they have shown us a picture depicts the almost done preparation for tomorrow Taylor Swift concert at Putra Indoor Stadium . In the first day releasing Malaysia RED Tour tickets by official ticket agency in Malaysia, Large traffic congestion at each ticket booths. It also happened to their website large number of online traffic queue up for the tickets. After a few hours approaching lunch time tickets have been half sold from 10.00AM . It is an unprecedented decision by Taylor Swift organizing ASEAN RED Tour. Previously, Taylor Swift fans have to purchase air ticket fly to a far country for her concert. It is her first performance in Malaysia.